The growing Himalayas are a temptation for those that want to be tethered to them – or want to free climb the mountains. Whatever your pleasure, these young mountains are sure to offer enough finger-clinging holds to give a lifetime of memories. Most trekking outfitters offer all the gear you’ll need for mountaineering. But for more specific climbing needs, consider coming loaded with your own gear. Rock Climbing is perhaps one of the least promoted sport in Nepal. However, some rock faces have been developed as training grounds for enthusiastic climbers both local and foreign. Nepal Mountaineering Association (NMA) has been providing separate training on rock climbing for the last six years to school -(children and to college students basically to arouse their interest in this field as well as in mountaineering. Rock climbing as a sport started in the United Kingdom in the 60’s. As the sport grew, climbers found it difficult to get a way from work and pursue climbing in the hills on a regular basis. 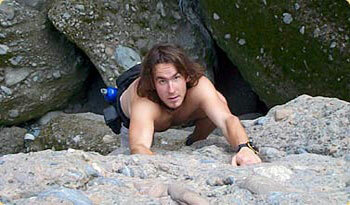 Climbing enthusiasts found it difficult to go far away from the cities after work. Therefore, they improvised methods and attempted the steep corners of the buildings to simulate the rock climbing. Thus started the present day simulated rock climbing. These can be built right in the heart of cities or indoors and they provide easy and convenient access to climbers. In India, this new sport of climbing is catching up very fast and there is also a rapid expansion going on in creating basic infrastructure facilities. Rock climbing is not very different from mountaineering except that instead of snow there are rocks involved in this adventure sport. Rock climbing’s most basic features include climbing a rock face, using only hands, feet and a safety rope. If you are good at climbing, then you can definitely try out this sport. But, some rock traverses in certain areas extend over great lengths and merit championship status. Certain climbs can often prove grueling and tough, but the magic of the surrounding mountains landscapes always keep the spirits high of a climber.